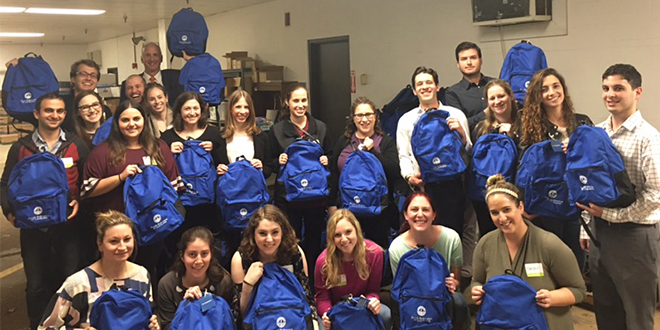 Federation's Young Leadership Division sorts and stocks hundreds of backpacks to keep Jewish Cleveland safe. Securing our community is one of the top priorities of the Jewish Federation of Cleveland. Thanks to a generous donation from Barb and Abe Miller, the Federation will be distributing 550 Project Safe Classroom Backpacks to Jewish Cleveland classrooms, including all Jewish Cleveland day schools, religious schools, and early childhood centers. 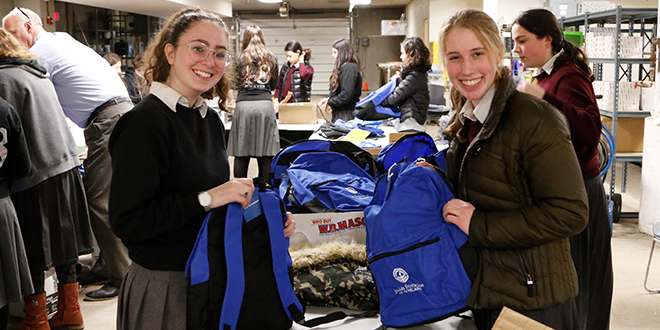 Over the course of two days, students from Yavne School for Girls and Fuchs Mizrachi School – Federation beneficiary agencies – as well as members of our Young Leadership Division (YLD) volunteered their time to fill the backpacks with medical and emergency supplies and safety equipment. Q – How do you feel about helping to keep children safe in our community? Simcha – It feels amazing! It shows that our generation can do something; we’re protecting our own. We can all do our part if something does happen, and we know there is a system in place. Even if there’s not the threat of a shooter, there’s a comfort. We think about it all the time. When we see something happen at another school, it brings us down. It gets scary sometimes, but knowing that there are police around and others trained to protect our school, we feel very safe. And now, we can also help ourselves if we need to. Aaron – I feel a sense of unity and pride in our community. First, hearing a presentation from the Federation security, learning all of the hard work they put in each and every day to keep the Jewish community safe; then, as a group of YLD volunteers putting together over 300 backpacks to be distributed to the Jewish schools. Safety in our community is so important and the fact that we came together for this event speaks to the strength of the Jewish Cleveland community. Students from Yavne School for Girls with Project Safe Classroom Backpacks. Q – Did you learn anything additionally about protecting yourself during an emergency? Simcha – Before we began filling the backpacks, we heard from Federation security who let us know why it’s important to have a safety plan in place. We never really thought about it, but when it was explained, it makes sense. But we know we’re helping the community by filling these backpacks. Thinking about a threat actually happening in our school – it’s scary. But it’s comforting knowing we’ll have protection there and we can use it. We’ve talked about it, you can use almost anything as a protection – we can throw our textbooks, pencils, anything at an intruder – it’s about distraction. 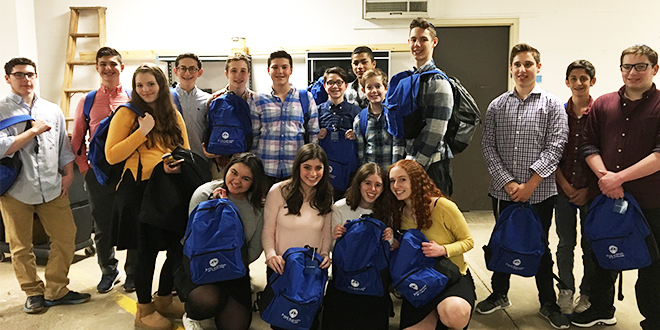 Students from Fuchs Mizrachi School voluntter to help keep Jewish Cleveland safe. Q – What does it mean to you that you are helping safeguard the entire Jewish Cleveland community? Simcha – Doing this for the Federation, we all got really excited. We know we’re helping out by putting these safety supplies in classrooms around the community. Maybe one day one of these backpacks might save a life, and we know we were there, we helped that, we were a part of that. That was us contributing to that. Aaron – It was a special evening having young leaders in the Jewish community do their part in helping keep our future generations safe. To have been amongst the group of YLD’ers who came together for this event at the Federation was truly inspiring. For more information about how the Jewish Federation of Cleveland works to safeguard our community, contact Oren Baratz at obaratz@jcfcleve.org or 216-593-2788.